If you've never taken the opportunity to visit the Gem State, now is your chance. Take in all the sites and sounds of the Potato State while participating in one of the best marathons in Idaho. The Lake Lowell Marathon is a Boston qualifier that you won't want to miss. The race proceeds go to the benefit of several local charities and non-profit organizations. Click here to read more about the Lake Lowell Marathon. The majority of the course is flat, with fairly significant hills at miles 3 and 25. Aid stations and port-a-potties are frequent, located every 2 miles on the course. While music devices are not forbidden, they are discouraged due to the fact that the course is not closed to traffic. This race takes place in Panhandle National Forest. According to race organizers, "[you will] run along the lake shore of pristine Priest Lake, through groves of lush forest, huge old-growth cedar trees, and big views of the rugged Selkirk Mountains." It's also a great race for ultra-marathoners. Click here for dates and registration info. The course website describes the race as having "The scenery of a trail race, but on drivable dirt forest road with full course support like a road race." Aid stations are located every 3 miles and are stocked with gels, chips, pretzels, nutrition bars, water, and sports drinks. The course is very hilly, so you'll need the energy. This rural, point to point race is pretty small. If you like lots of breath taking scenery without all of the crowds, this is a great race to look into. It's great for all experience levels, no matter if you're running your 1st marathon or your 50th. Click here to learn more. This is a great course for your first marathon. It is a downhill race that runs across both dirt and paved roads. 13 aid stations are spread out at 2 mile intervals through out the course. Take a look at the map down below. The City of Trees Marathon Association is dedicated to "provid[ing] quality running events that are tough, fun, and rewarding." This race is a chip timed Boston qualifier that you won't want to miss. Get registered here. 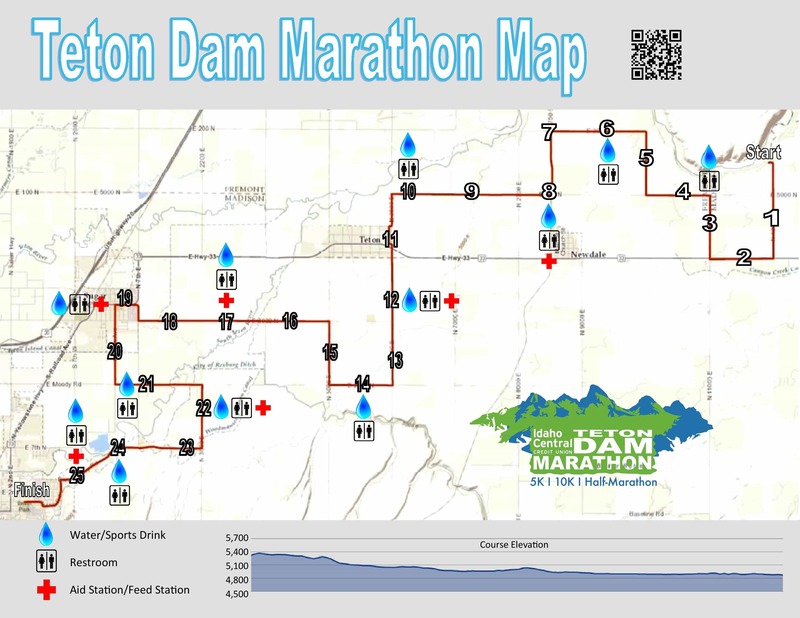 This race follows the Boise greenbelt and mostly shaded with aid stations every 2-3 miles. The course features many rolling hills but elevation gain is fairly moderate. While gels will be available at some stations, race organizers recommend carrying your own nutrition as well. The Pocatello Marathon is a Boston qualifying event that you won't want to miss. You won't see a lot of spectators, but the volunteers are top notch and put in a lot of effort to facilitate this first class event. Learn more on their website. This race take place on paved roads through Pocatello. The first half of the course is all down hill, dropping 1,400 feet in 13 miles. From there on the course flattens out. You'll want to do some down hill training for this one. Come take part in this American classic that has been going strong for 20 years. The volunteers are very experienced and put together a great event. If you're looking for some killer views, this Boston qualifier is the one for you. Check out their website. Aid stations will be supplied with gels, bars, water, and sports drink and set up at 2 mile intervals. The first half of the course starts out slightly down hill, with sharper downhill portions between miles 12 and 16. There is a 300 foot climb directly after the down hill portion, but once you best that, it's downhill all the way to the finish.